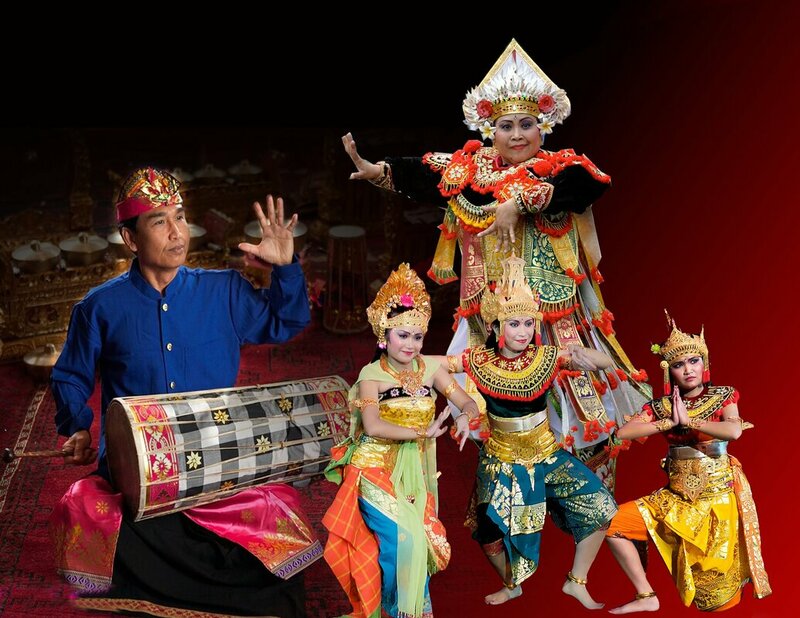 In Bali, Arts performances are always preceded by an act of offering and prayer. Pemungkah meaning "to open" or "to begin" is a ritual in which the musicians and dancers process into the performance area to present an offering and request the presence of Sang Hyang Taksu, the divine spirit who is asked to inhabit the bodies of performers and guide their performance. The accompanying processional music is called Beleganjur. This piece belongs to the Balinese genre of the welcome dance, in which dancers welcome guests by showering them with flowers at the close. The natural variety of flowers is symbolized both by the changing movements of the dancers and by the changing of melodic modes. A classic Balinese solo character dance depicting an authoritarian and boisterous martial leader. This composition is credited with being the first Gamelan work that began the wave of "Kebyar" style that swept the entire island of Bali after it's introduction in 1915. Kebyar has been interpreted as "lightning", "the bursting open of a flower" and "explosive". This style is highlighted by abrupt bursts of sound, shifts in tempo, rapid stops and a style of fast succession of themes within a single piece, in contrast with the more evenly colotomic and structured traditional repertoire of Balinese Gamelan. Traditionally a solo dance for a young woman, here set for 2 dancers, this piece depicts the lion, king of the forest. The name comes from an opening dance movement in which the dancer squints her eyes and does an S-shaped movement with her neck and head to the right. This imitates the eye movements of a sleeping lion. This instrumental form is often composed to honor prominent individuals and is performed as a closing or “farewell” piece.